TAB/6* - This bag is approximately 6 inches high by 12 inches wide. This is about the size of the typical vinyl bank bags. * We also stock a #5 brass zipper three inches wider that (13 inch zipper) would make the bag finish at approximately 15 inches wide. This wider zipper can be put in any of the above stock bags and would add an additional cost of $1.50 to the cost of each bag. ** We also stock a #5 brass zipper five inches wider that (15 inch zipper) would make the bag finish at approximately 17 inches wide. 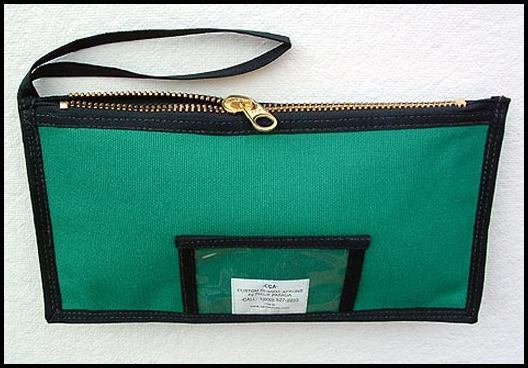 This wider zipper can be put in any of the above stock bags and would add an additional cost of $2.00 to the cost of each bag.